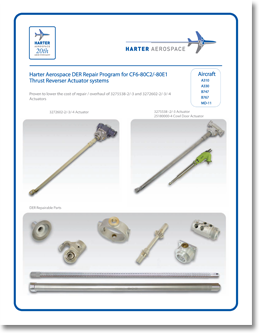 Our FAA Designated Engineering Representative (DER) approved repairs are the foundation of Harter's approach to repairing aircraft components which provide our clients with superior quality, reliability, and bottom line savings. Harter understands how expensive it is to purchase new OEM parts which often times have long lead time delays. Together with our Research & Development group and our Designated Engineering Representative, Harter will exhaust all resources to find a way to repair your non-serviceable parts economically, expeditiously, and with strict approved standards of quality. © 2018 Harter Aerospace. All Rights Reserved.